PrintOnCarpet produces eye-catching and durable Inlay Carpets. Unlike the traditional less-effective method of making a carpet by sewing several pieces sewn together, our revolutionary technology and advanced expertise allows us to create the dramatic inlay. We produce the work using our dye-sublimated print press that can create full color logos up to 8Ft x 10Ft. 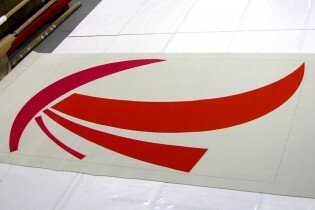 The entire logo is then printed and inlayed as one, into the main piece. Since we print using dye-sublimation, the colors will match your logo or image perfectly. The carpet can also be washed and cleaned, and will still retain its powerful color, despite being heavily walked on by crowds. Our Printed Carpet Inlays transform a blank floor into a dramatic showcase, and appear in everything from Hollywood Events, Fashion Features, Architect and Design Settings, to Universities, Schools and beyond. I have an inquiry for a carpet to print, with a size that I have not been able to get online from any supplier. However I was wondering if it is possible for me to get a quotation on a carpet of 4m length by 1m width in size. Kindly do get back to me the soonest possible for me to be able to know if you guys can supply me with a requirement as of such. 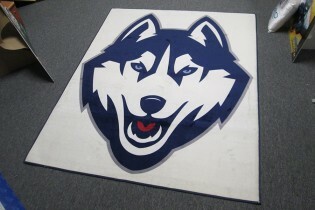 We can absolutely print carpet 4m by 1m. Please email joconnor@eacgs.com for more information.